HISD Nutrition Services Officer Betti Wiggins has been selected as one of 10 women featured in the NBC News series, She Thrives: Black Women Making History Today. The series is sponsored by NBCBLK, NBC News Digital’s online platform focusing on the African-American community. The series highlights the contributions of black women “who are altering the way of life for everyone in 21st century America,” according to the She Thrives website. Wiggins was selected for the honor based on her extensive work in child nutrition. Wiggins joined HISD’s Nutrition Services in 2017 and oversaw the department’s move to establish its own child nutrition operation following the departure of Aramark, an outside vendor that had overseen the district’s food service program for roughly two decades. Her efforts led to revamped school menus that focus on serving students “good food” that is wholesome, nutritious, colorful, and locally sourced. In her time at HISD, she led Nutrition Services in feeding families during Hurricane Harvey, secured free meals for all students during the 2018-2019 school year, and has orchestrated the addition of salad bars to nearly every school in the district. 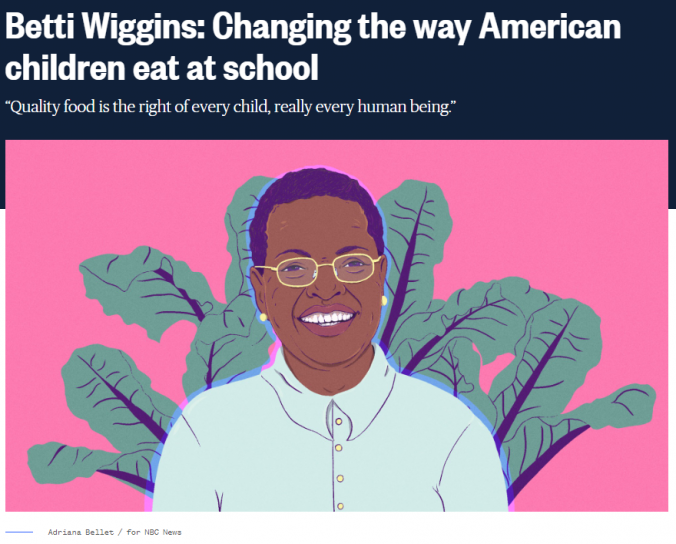 Prior to joining Houston ISD, Wiggins served as the executive director of the Office of School Nutrition for Detroit Public Schools Community District, where she was responsible for school-based meal operations in 141 schools. This entry was posted in Achievement/Recognition, Business Operations, News, Nutrition Services on February 6, 2019 by HISD Communications.